Traveling to the United States of America was just a dream for me back then. I still can’t believe that trip was even real. Thinking about it in the context of my whole life, it seems more like a fantasy than something that actually happened in reality. But it happened. In my first week in the US, I observed that Americans were very expressive about their feeling and ideas. Another thing I observed was Americans were very patriotic in giving honor to their people who served the country and to their national flag. I saw most of the houses hanging their flag and even wearing it. I had a hard time understanding their culture, however, I found it amazing and interesting to learn the historical contexts of their social behavior. I’m proud to wear my Erumanen Ne Menuvu tribal attire while in this Indigenous Peoples’ Values Conference, Syracuse, New York, USA. 15-18 August 2018. I was sent by my organization, PeaceBuilders Community, with the help of our peacebuilding partners to attend an indigenous conference in Syracuse, New York. 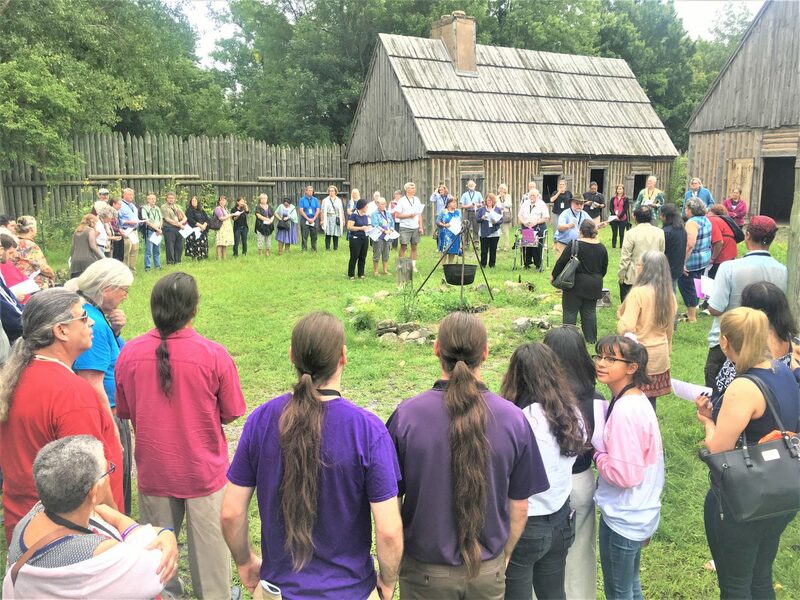 The main objectives of this trip were to learn and understand the culture of the first nations of Turtle Island (North America), as well as how the Indigenous Peoples of Turtle Island were treated, and are being treated, by their colonizers — the United States of America. Part of the conference was learning about the Doctrine of Discovery. This new knowledge helped me realize how the First Nations were violated, and are still being violated, by their colonizers. Through violence, they were prevented, and are still being prevented, from their right to become who they are. One of the highlights of this conference was the burning of copies of Papal Bulls in the 1400s that provided religious and political justification for violent colonization of Turtle Island by the European empires under the banner of Christianity. The story of their struggle and their fight for sovereignty are not far from the story of the Indigenous Peoples in the Philippines. I now have a better understanding of the common struggles of the Indigenous people in the world. We all have been marginalized by the Doctrine of Discovery. I am a bit disappointed with some aspects of the conference because it wasn’t the way I expected. But that was an exception. The Doctrine of Discovery: Misusing the Name of Christ. In the 1400s, a series of Papal Bulls were declared and sanctioned explorers to invade, colonize, and exploit lands and peoples around the world. The Doctrine of Discovery is the unsound theological basis for the colonialism and imperialism that still oppress many Indigenous Peoples today. These were done by the European imperial monarchs in the name of Christ. This trip to the United States of America changed my whole outlook in life, and helped shape my dreams for the Filipinos and for my country. To hope and dream is never too late. I am not lucky. I am blessed. This is how I describe my experience. I ‘m blessed enough to experience the unexpected blessings of my Creator. I was able to travel through four states of the US–New York, New Jersey, District of Columbia, and, Virginia. The government of America, in my impression, gives freedom to every state when it comes to economic development. Often described as “a city of endless possibilities, high energy, and great diversity,” New York City had always been on top of my bucket list. This place really is a dream for me and never could imagine that one day I’ll be walking on the famous busy streets of Manhattan. Times Square. Empire State. Central Park. The 9/11 Memorial Park. Grand Central Station. Everything about Manhattan, before this real experience, was just only in the movies and books. The experience was great. I had to walk fast while enjoying looking at the people and buildings! Statue of Liberty. 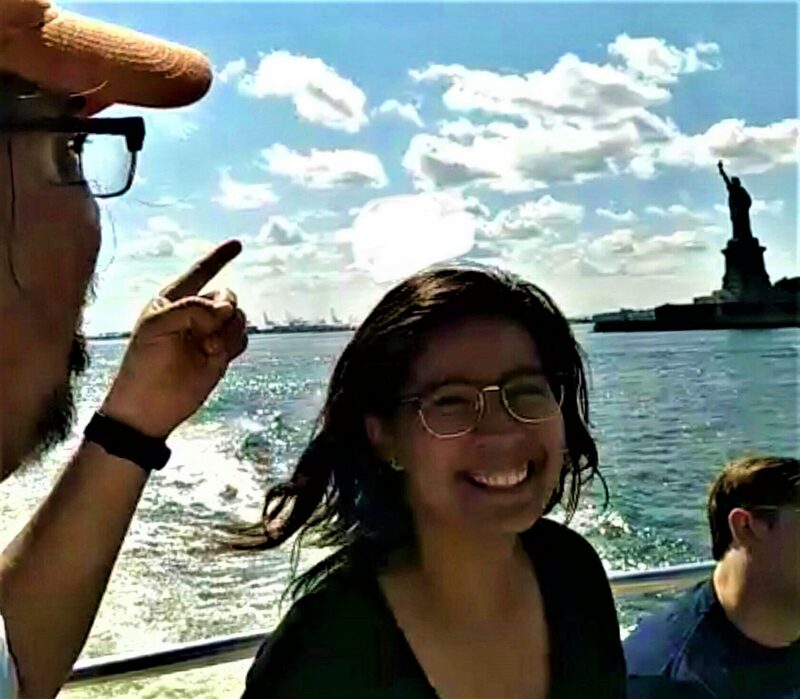 Enjoying being a tourist in New York with one of my mentors at PeaceBuilders Community, Ka Boyet. 20-30 August 2018. A day in Washington DC is a day of learning. The state was known as the capital of the United States of America, where White House, World War 2 Memorial, Washington monument and Abraham Lincoln Memorial are the famous historical tourist destinations. By roaming around, it gave me the chance to understanding deeper the history of World War 2. My spirit was crying for justice and peace for the soldiers who fought for their county especially the Filipino soldiers. A country may claim victory; however, it will still depend on what one thinks about war and what it really means to win a war. I was wondering about the trauma of violence for both the so-called winners and the so-called losers. 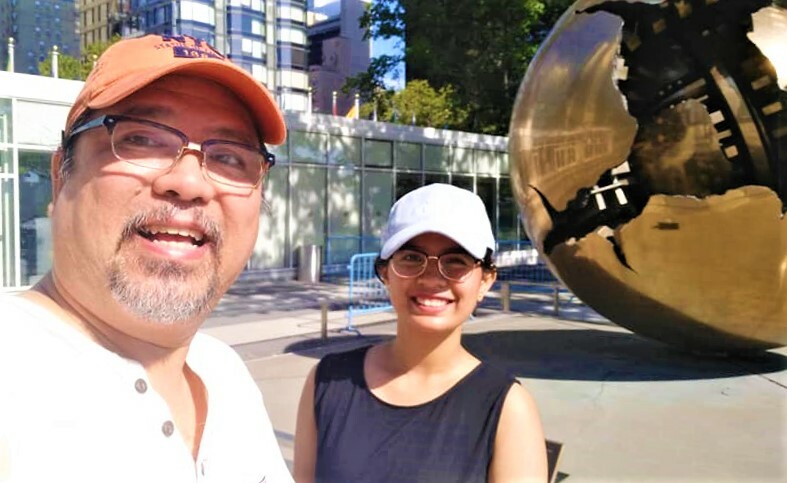 United Nations Center: Sightseeing with Ka Boyet around New York City. We also did a kind of nature-oriented activity. We went to a famous cave in Virginia — the Luray Caverns. I was absolutely mesmerized by its striking beauty. The formations were like unique sculptures, a masterpiece of natural art! My favorite part of the cave was the “Dream Lake”–a giant reflection pool which mirrors the stalactites across the top of the water. The reflections gave it a surreal depth. The beauty was magical! The reflection across the water was perhaps one of the most beautiful natural reflections I have ever seen. But despite the beauty and excitement brought to me by this particular cave-experience, a sadness and disappointment dominated my feelings. From my Indigenous point-of-view, the creation had been desecrated by making it a commercial tourist attraction. The Creator’s handiwork is being commodified here. As sad reality indeed; a reality that led me to think of our own ancestral domains in Mindanao. Is it too late for us, as Erumanen Ne Menuvu, and to the wider Indigenous Peoples in the Philippines, to save God’s creation that have been entrusted to us within our respective ancestral domains? 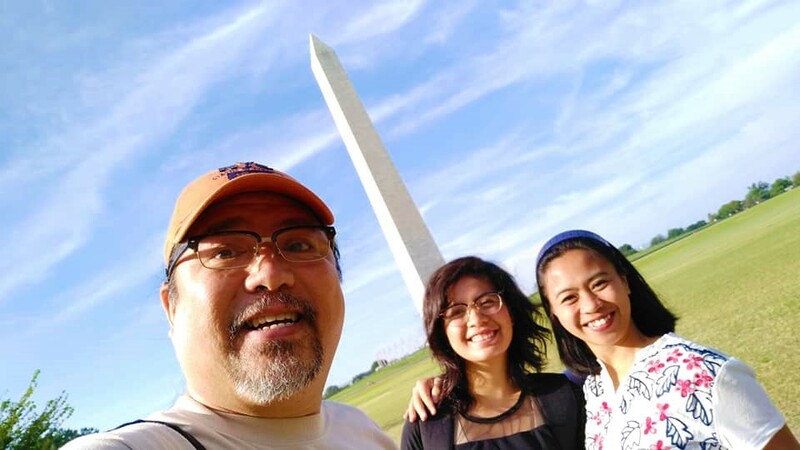 Washington, DC: It was so exciting to see Ate Tala in this part of the world. A few weeks before this, we were trekking together through an armed-conflicted zone in Mindanao. Grateful to Ka Boyet for driving us around and for being our Mentor-Kuya in this learning tour. One of the big highlights of this trip was a visit with Ate Tala Alngag Bautista in his new home Harrisonburg, Virginia. Ate Tala is our Chief Operating Officer at PeaceBuilders Community, Inc. (PBCI) and also the Senior Vice President of Coffee for Peace (CFP). 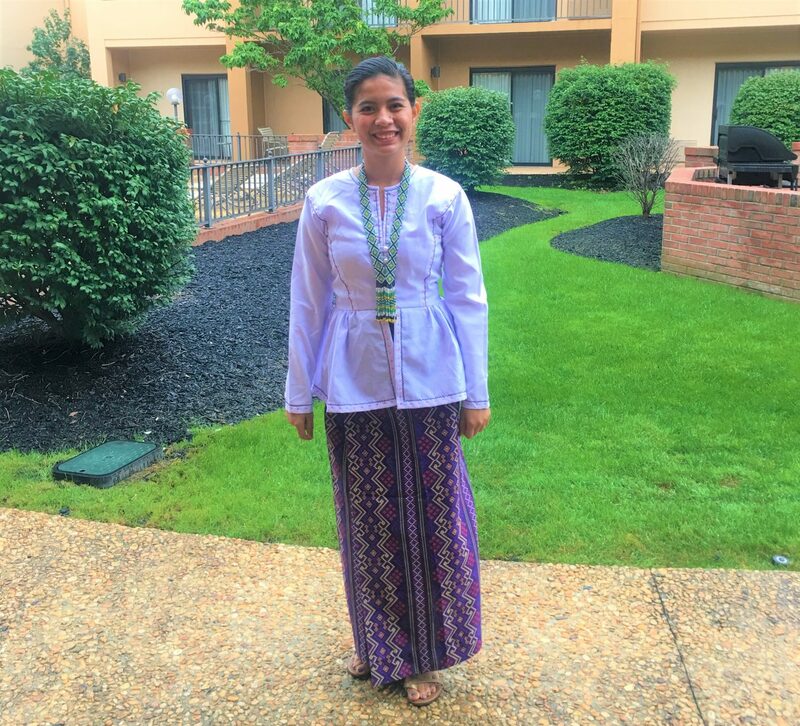 She’s on study leave, taking up a Master of Arts program in Conflict Transformation at The Center for Justice and Peacebuilding, Eastern Mennonite University. She will be in this town for 2 years and will resume her responsibilities with PBCI-CFP. New Jersey has become a home place during my stay in the US. I’m so grateful to have met two families that are rooted into their passion by helping the people in need, guided by biblical principles. I had also the chance to meet the community that they are helping. In my observation, that community have too much resources coming from the government. It seems the people have become too dependent on government handouts. For that reason, they seem to have lost the motivation to produce their own sources of livelihood. This is so different from what is happening in the Philippines. There, our natural resources are overflowing – minerals, waters, vegetation, natural gas. However, when one is not in the position of power and no political connections, there’s no way one can avail of the benefits of such rich natural resources. Both the US and the Philippines have rich natural resources. Both have problems with unjust systems. My experience of America confused me. Traveling interstate, I saw how huge the land and how rich the resources the Americans already have. But my question is, why does America still need to invade smaller countries and steal the Indigenous Peoples’ natural resources? It was also a blessing to work directly with Ka Boyet. Being with him during the trip, I had a chance to know him better as our senior consultant, as a spiritual father, and how he is rooted in the love of the Creator while serving the people. I learned a lot from him, especially in his facilitating skills. Being in the field of community development I realized that I need also to identify my position when it comes to facilitation. Many of the facilitators are turned between neutral facilitator and facilitator with an agenda. Observing his way of facilitation, he is neutral, letting the participants come up with an idea and focus on how to get insights from them for the session’s goal. It is not about his idea; it is about aiding the process. I noticed also that he is very particular with the venue that he could turn an ordinary wall into a meaningful learning center. He is very attentive in listening and he is good at creating an inclusive environment. I am so grateful to him for letting me experience his ministry and to be a part of his US travel. Please accept my gratitude, Mr. Rich Gutowski. In most instances, it would be hard to become generous to everyone. In my interaction with Rich, I learned that generosity is a way of our Creator to teach us to love our neighbors. The more I reflect on generosity, the more I’m realizing that I must also learn to give — my time, my gifts and talents, and even my scarce financial resources to bless those in need. Everything I have is a free gift from above. My life is already a gift from Him. This trip challenged me and inspired me the more to utilize the blessings with which I have been entrusted to become a blessing to others in return. My prayer is that God would bless Rich Gutowski exceedingly, abundantly more than he could ever ask or imagine, and that he would prosper in all he does.